The Sir-loin Beef sausage has a regal flavor that is pronounced and bold. Meaty, rich with texture and perfectly spiced, it is surly for the most refined and gourmet enthusiast. Sirloin is a prime cut of beef that is lean and perfect for flavoring and marinating. It has taken the Meaty Meats taste specialist years to perfect the right cut of beef to make the best Beef sausage possible. Then, choosing the perfect complimenting herbs and spices that continue to enhance the sirloin flavor until it is ready to be savored – hot off the Barbeque or straight out of the oven. We start with the fines cuts of all natural beef that is free of antibiotics or growth hormones. The fresh sirloin is hand cut in our state of the art, federally accredited facility by our meat cutters that have dedicated their lives to their craft, not on a production line where attention to detail can be lost. Then, in small batches, we season the sirloin to perfection. Our taste artisans have scoured the globe to search for premium quality herbs and spices that would surely put Marco Polo’s determination to the test. Only the best ingredients make the best product. Only quality and great taste comes from painstaking attention to detail and dedication to perfection – that is the Meaty Meats way. 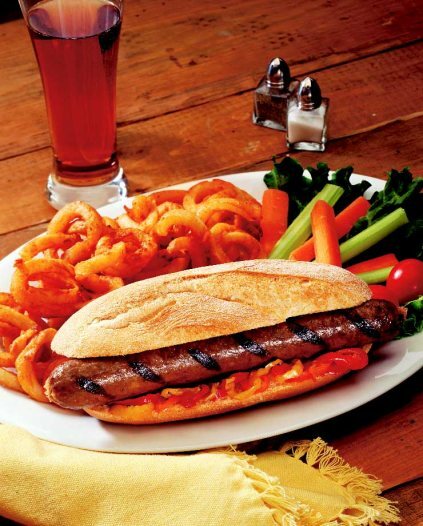 The Sir-Loin Beef Sausage is a gourmet product that we’d serve to our guests in our own homes. Please feel free to try some of our recipes by following the “Recipes” link.